Sea revisits the past week in his world, including an exciting weekend exploring Prague. Hello everybody! What an amazing, powerful, inspirational last week of life. In a parallel universe, in another lifetime, I attended my second Borderland festival – Denmark’s regional Burning Man. It’s where much of the recent magic in my present world – and the Plan Sea book – began. However, it was not to be this year, as a late venue change eliminated the possibility of my ambitious art/music project. On a personal front, I didn’t want the week to be about or around my ex-girlfriend, who I met there last year. And to give us both space to move on with our lives. Instead, I enjoyed a fantastic week in Decin, with my friend Laura visiting for a few days, then a weekend in Prague. I was extremely productive with work over a few quiet weekdays, rediscovering my long lost drive. It’s been nice to be immersed in quiet for a couple of weeks, but in a few days, that solitude will be over for a while. After catching up on highlights from the past week, I’ll preview my forthcoming Baltic trip. 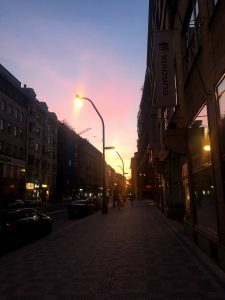 My visit to Prague came together as a work trip, with a need to find a videographer for a partner’s project. I didn’t want to spend a weekend alone in quiet Decin, and desired to dig deeper into Prague. After posting in a group for remote workers, fellow digital nomad, Benno, sent me a message. We have several interesting mutual friends, and he suggested we touch base over the weekend. It’s nice to be able to meet up with people in new cities. Taking the morning train from Decin, I arrived in Prague, enjoying a late breakfast at the excellent Globe Bookstore and Cafe. I caught up on my work emails, client support and writing. 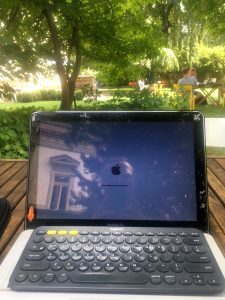 After that, I walked forty minutes through Prague to check out K10 Coworking Space. They offer free trial days, and, after a tour, I worked for several hours from their glorious back garden. With my work for the week accomplished, another forty minute walk took me to check in at Hostel Marabou. This budget hostel features a lovely outdoor patio, and comfortable beds. Maybe a pleasant 15-20 minute walk from town (I love walking, particularly in new places). After tasty Indian food at a Bangladeshi restaurant near the centre, I walked to the old quarters of Praha 1, for an apartment party at Benno’s. There was a large inflatable boat on the living room floor – uniquely comfortable! Sort of like a Carpet 2.0. I also found my videographer – a photographer with the tools and vision I seek. Mission accomplished! I wound up staying until around 6am, walking back to Hostel Marabou and sleeping by 7am. 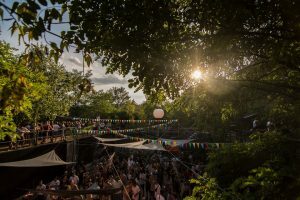 Hoping to gain a better sense of Prague’s nightlife, I was invited to an open air techno party about forty minutes tram south of central Prague. This was an awesome party, with a soundsystem submerged in a concrete bunker. The weather, after scattered raindrops from clearing clouds, was perfect. Not too hot. 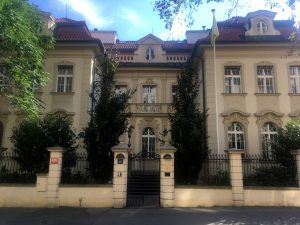 I met up with Benno, fellow Vipassana meditator Victor, and their German digital nomadic crew currently based in Prague. A Czech techno promoter, Jan, was most kind and generous to us. He looked after us, and invited me to their party on the top of a Czech mountain this weekend! Our group danced and chatted for hours. Beautiful energies around us. It was a really nice vibe. The party ended around 11pm, and some of us headed to the official afterparty, at Ankali, closer to the city centre. There is a small outdoor area that was popular with smokers, a nearly pitch-black dance floor, a few rooms with couches, and a long bar. I bonded with Victor, and Benno arrived much later. There were a few locals and Germans that were very kind to us. I spent most of my time in near-darkness on the dancefloor. At a certain point, I was exhausted, and decided not to push my luck. Needing to check out from my hostel by 11am, after another forty minute walk I arrived at Marabou around 7am, for a few hours of sleep. From there I walked to the top-notch Cacao Cafe, and devoured maple syrup french toast with one of the best-ever mocha coffees. An afternoon train back to Decin ahead of an inspired, reflective Sunday evening, appreciating the brilliant week I was blessed to enjoy. Everything is coming together. My new Estonian-based Nomadical OU company is now registered, and the necessary admin such as banking, domains and websites are well in progress. LeapIN is a great service to set up projects in Estonia’s digital nomad-friendly business and tax system. My time in Decin has been fantastic for accomplishing what I needed on the work end. Relaxed headspace, minimal distractions. A gorgeous backdrop palette of natural, pastel colours. Thank you so much to my NZ artist friend Peter for welcoming me here again. You read it here before anybody else, next week we are opening up Beta invitations to the upcoming Nomadic.Cloud network. Nomadic.Cloud is international, roaming web hosting for digital nomads, freelancers and agencies. Beyond localised communities and resources, its engine helps match paid tasks to necessary skills, fueling digital nomads everywhere. Proudly developed by Mother.Domains. We’re also planning the Nomadical App, designed to accomplish everything we digital nomads need on the road. This may even become a Holochain app, but it will thrive in some form sometime in 2019. More to come soon on these very exciting developments! The techno promoter, Jan, glowingly described the panoramic setting for this party. A party on the top of a Czech mountain! Randomly chatting with my German friend Nicole I know from many years in Melbourne, she decided to accompany me. Nicole is currently working in Vienna for the month, and, with my Baltic trip plans, it was looking like we might not cross paths before she leaves. 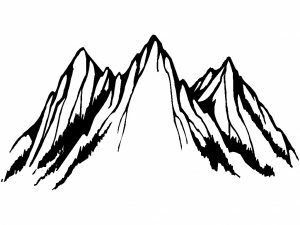 Instead, we’re meeting in Prague on Friday evening, and finding our way to the mountain rave on Saturday morning. No idea how or when we’ll get there, but that is the exciting part of the journey! Coming Next Week: The Baltic Tour Begins! 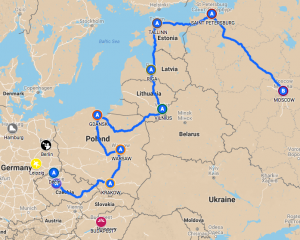 In a year of epic adventures, perhaps the craziest is my upcoming trip through the Baltic states beginning next week. On Wednesday I depart Decin for Prague, and take a midnight bus to Krakow, Poland. After that I’m heading through Gdansk, Vilnius and Riga, with no set plans, only work-related research and networking objectives. My main mission is a casual bank meeting in Tallinn, capital of Estonia, to open an account for Nomadical. To get there, I’m devising an elaborate yet low budget journey along the way, through Poland, Lithuania and Latvia. All my transportation is looking around, if not a little under, €100. After August spent reaching Tallinn, I’m intrigued by the prospect of returning to Russia to research the local nomadic scene and reconnect with some Russian friends. I haven’t yet been to St. Petersburg, and Moscow made a huge impression on me two years ago. Then, a flight to Budapest to check out the final city I’m legitimately curious about basing myself in for a while. I love the Hungarian vibe, from what I’ve experienced so far. Trains back through Czech to Hamburg, for the only thing locked in on my calendar: David August at Hamburg’s Elbphilharmonie, live with a top orchestra. David August is my favourite artist in the world at the moment. Returning to Berlin the final week of September. That’s two crazy months right there. The most interesting thing about all this is that a few days ago I only had €2 left in my bank account. 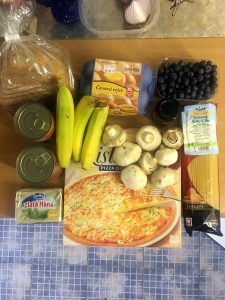 This is after I spent €10 on food for a couple of days, to keep me afloat until other money arrived. This has been the story of my life for nearly two decades. It’s not easy – but I find a way to live life to the fullest, without riches. There is a knack to it that I will share soon. The moral: Don’t be disheartened or let money get you down. Keep dreaming! Next week I’ll be writing from Krakow, reporting on the mountain rave experience, and my journey to Poland. I’ll be sharing more insight into how dreams supersede any obstacles and challenges in the way. Have a super weekend… and chat soon!